The Cosmosphere has received the FATP 25th Anniversary Flag flown on the Space Shuttle Atlantis mission that launced May 14. It just arrived at the Cosmosphere still encased in the fire retardant plastic everything goes up in. The flag is white, but the plastic is pink, which gives it a rosy hue. Around the edges, where it's sealed, you can see the pink more clearly. Stephen Bowen, a Mission Specialist for STS-132, made arrangements for the flag to go into space on the final flight of Atlantis. It's item number 47 on this list. It came with a certificate of authenticity signed by Bowen. Bowen is the first Submarine Officer selected by NASA in July 2000 as a mission specialist. This is his second space flight. His first was STS-126 in 2008. Bowen has logged a total of 27 days, 14 hours, 57 minutes and 39 seconds in space, including 34 hours and 30 minutes of EVA in 5 space walks. 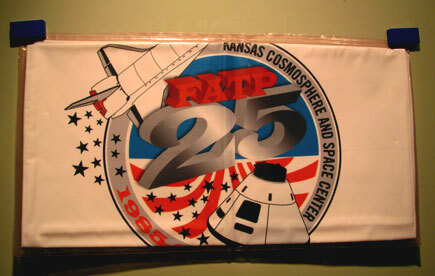 This summer marks the 25th anniversary of camps at the Cosmosphere. Needless to say, we're thrilled to have this flag flown on a mission. 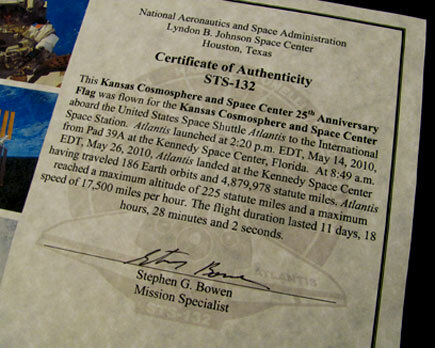 The flag will eventually be on display at the Cosmosphere. 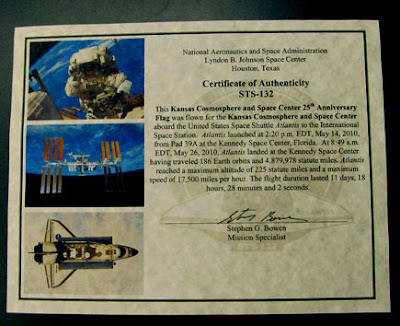 Read more about the flight, and see photos at http://www.nasa.gov/mission_pages/shuttle/shuttlemissions/sts132/main/index.html. Teresa Sindelar first came to the Cosmosphere as an 11 year old attending space camp in 1989. Now, she’s headed to NASA’s Johnson Space Center in Houston to be a NASA Education Specialist in the Teaching from Space Office. In fact, she came back a couple of years later for a Level 2 camp, and then worked as a counselor for three years. In 2002 she became a full-time employee in the education department at the Cosmosphere. She left five years later to teach in the Buhler school system while she worked on her master’s degree, but returned to the Cosmosphere in the summers to help with camp. But her dream was always to work at NASA. "I have a very unusual skill set,” she says. "Everything I’ve ever done has led to securing this job. I don’t think I would have gotten it without my background at the Cosmosphere.” She said when she left the Cosmosphere to teach it was very difficult to leave, but she knew she needed to be in a classroom to get to her ultimate goal. She said the experiences at the Cosmosphere and Buhler made her a different kind of teacher. “Not a lot of people go to school to be an educator for NASA and there aren’t a lot of those jobs. Not a lot of people have that kind of resume,” she says. Everyone at the Cosmosphere is so excited for Teresa. She will join other Cosmosphere alums now working with NASA. Best wishes to Teresa, Dan, son Mason and daughter Layla, for their new life in Houston. We’re going to miss having Teresa around the Cosmosphere. NASA – you’re getting a good one! Voyager 1 will complete 12,000 days of continuous operations on July 13, 2010. The Voyager 1 spacecraft is a robotic space probe, weighing more than 1,500 pounds, launched September 5, 1977. Even after nearly 33 years, it still receives commands from, and transmits information to, Earth. Its original mission was to visit Jupiter and Saturn, and it was the first probe to provide detailed images of the moons of these planets. Voyager 1 is currently pursuing its extended mission to locate and study the boundaries of the solar system. 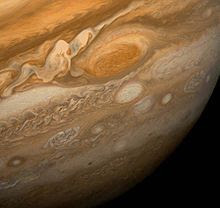 Voyager 1 began photographing Jupiter in January 1979, and continued taking photos of Jupiter and its moons into April that year. Voyager 1 and its twin, Voyager 2, made a number of important discoveries about Jupiter, its satellites, its radiation belts, and its never-before-seen planetary rings. 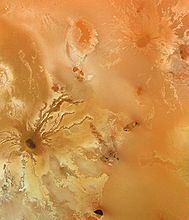 The most surprising discovery in the that area was the existence of volcanic activity on the moon Io, which had not been observed either from the ground or by earlier probes. 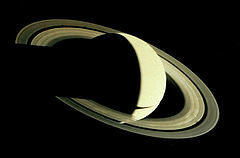 Both Voyagers went on to visit Saturn and its system of moons and rings. In November of 1980 Voyager 1 had its closest approach to Saturn and came within 77,000 miles of Saturn's cloud-tops. The space probe's cameras detected complex structures in the rings of Saturn, and its remote sensing instruments studied the atmospheres of Saturn and its giant moon Titan. Voyager 1 provided photos of Titan's thick haze and images of Saturn's rings. On February 14, 1990, Voyager 1 took the first ever "family portrait" of our solar system as seen from outside, which includes the famous image known as the "Pale Blue Dot." NASA turned the camera back toward Earth and took the picture in which it shows up as the "Pale Blue Dot" at the request of Carl Sagan. Sagan used the phrase as part of the title for his 1994 book. It is estimated that both Voyager craft have sufficient electrical power to operate their radio transmitters until at least after 2025, which will be over 48 years after launch. On November 17, 1998, Voyager 1 became the most distant man-made object from Earth. It is currently the most distant functioning space probe to receive commands and transmit information to Earth. Provided Voyager 1 doesn't collide with any stellar objects, the newest space probes will not pass it within a human lifespan, despite being launched from Earth at a faster speed than either Voyager spacecraft. 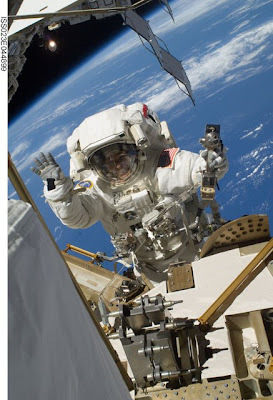 Coffee at the Cosmo on Thursday, July 15, is entitled, “As Seen on NASA TV: NASA Sources for Spin-off Technologies.” It is at 9 a.m. at the Cosmosphere and is free and open to the public. The ingenuity required to put a man on the moon resulted in numerous products we still use today. NASA engineers had to “think outside the box” in a major way. If you’re walking around with scratch-resistant lenses in your eyeglasses, have ever had an ultrasound or an MRI, used a TV satellite dish, benefited from Dopplar Radar, dressed your child in fire-retardant clothing, used a cordless power tool, or have a smoke detector hanging in your house you can thank the space program. By the same token, some things associated with the space race were not actually a product of it. For example, Velcro was invented at the same time, and used extensively by NASA, but it was not developed by or for NASA. Artifacts not currently on display will be used to illustrate the topic of spin-offs. You’ll have an opportunity for a close-up look after the presentation. 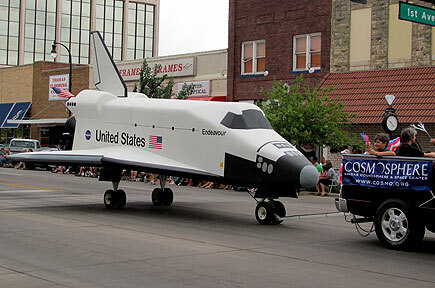 The Cosmosphere was in the Fourth of July parade in Hutchinson Saturday morning. Happy Fourth!